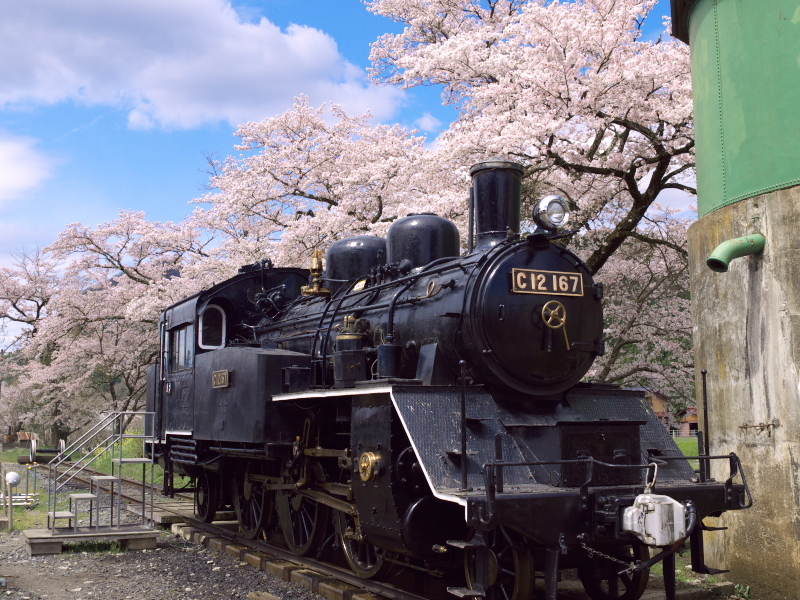 In Tottori, surrounded by the beautiful nature, you can enjoy cherry blossoms without being bothered by crowds. This is the most popular viewing place in Tottori. 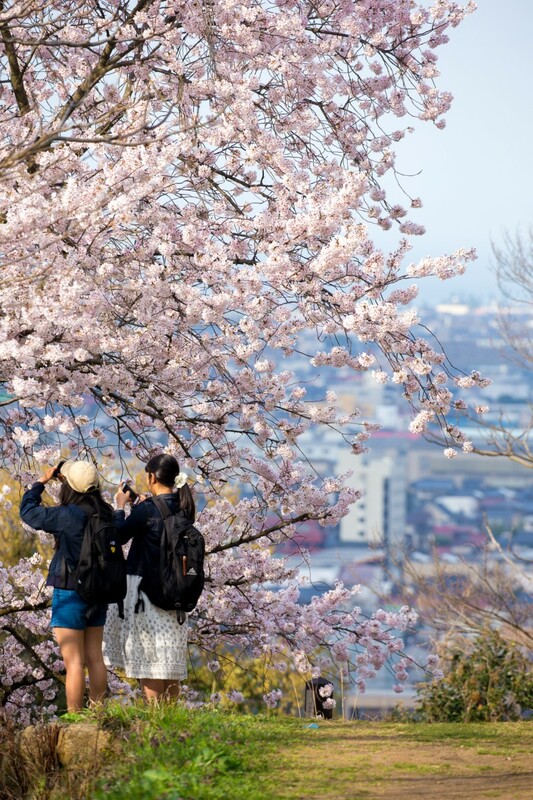 Many people come to see the soft shades of pink against the backdrop of Tottori Castle ruins and the historical Jinpukaku building which make the cherry blossoms look all the more beautiful. At the entrance of the park, there is a designated tree that provides the blossoming forecast in Tottori. 【Public transport】Take the 100 yen loop bus “Kuru Nashi” (green course) from JR Tottori Station. Short walk from “Jinpukaku – Kenritsu Hakubutsukan” bus stop. Yonago’s castle ruins overlook the city, Lake Nakaumi and Mt. Daisen in the distance. In front of Lake Nakaumi, people can enjoy taking a stroll under beautiful cherry trees and admire the sculptures along Chokoku road. 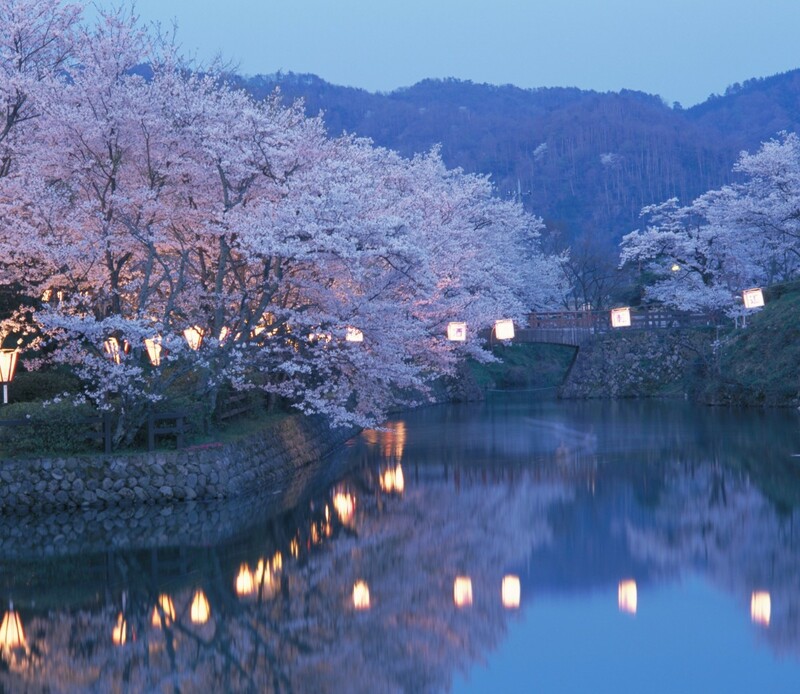 You can also take a boat ride and enjoy viewing the cherry blossoms from Kamogawa River which flows beside the walkway. 【Public transport】15-min walk from JR Yonago Station.Take Dandan Bus and get off at “Minatoyama Koen Mae” bus stop (5-min walk). This park features a range of cherry varieties and other flowers such as azaleas in spring. With the fresh greenery in summer, changing colors of foliage in autumn and camellias in winter, this park offers a different picture each season. It is also considered a healing place and is selected as one of “Japan’s Best 100 Urban Parks”. 【Public transport】Take the local bus from JR Kurayoshi Station. It’s a short walk from “Shiyakusho – Utsubuki Koen Iriguchi” bus stop or a 10-min walk from “Akagawara – Shirakabe Dozo” bus stop. 【Car】 40 min from Yonago Expressway’s “Yubara IC” via Route 313 and Route 38. 【Public transport】From JR Tottori Station, take the Wakasa Line to Wakasa and get off at “Wakasa Station”. 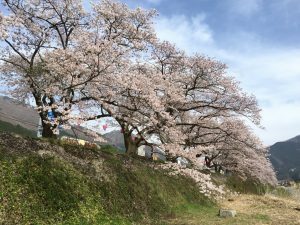 Near the old Hosshoji Castle remains, over 700 cherry (sakura) trees covering an area of 2km blossom along the riverbank. This area is bustled with stalls during the sakura season and the night display of paper lanterns is simply magical! 【Public transport】 From JR Yonago Station, take Hinomaru Bus’ Kami Nagata – Ookiya Line (southbound).7 -min walk from “Hosshoji Kami” bus stop. 【Car】20 min from Sanin Expressway’s “Yonago Nishi (West) IC” via Route 180. Discover a 16m-long ceiling relief of a dragon inside the shrine – one of the largest dragon reliefs in Japan! 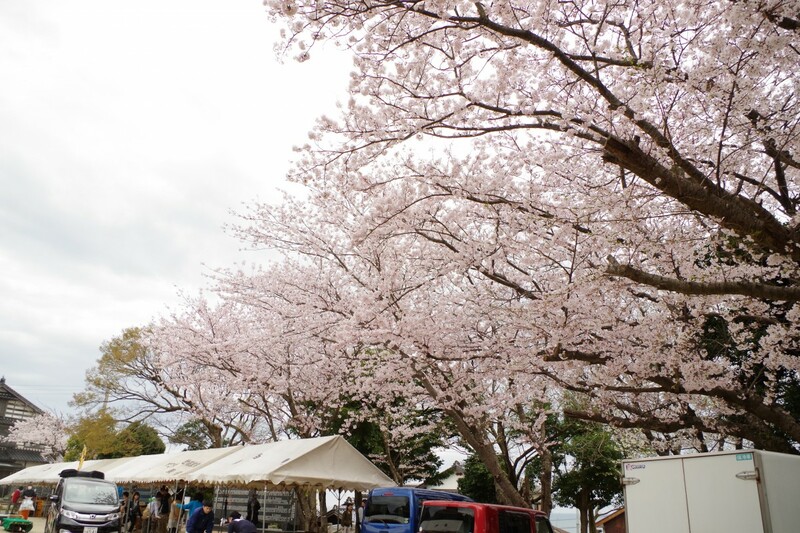 In early April, the shrine becomes lively with its “Kojin Markets” as people come to enjoy the flower viewing. 【Public transport】From JR Akasaki Station, take the local bus to “Kojin-machi” bus stop (5 min) and walk for 10 min. 【Car】50 min by car from JR Yonago Station and 70-min from JR Tottori Station. 5 mins from Sanin Expressway’s Kotoura Senjosan IC via Route 9. This castle dates back to the Warring States Period. 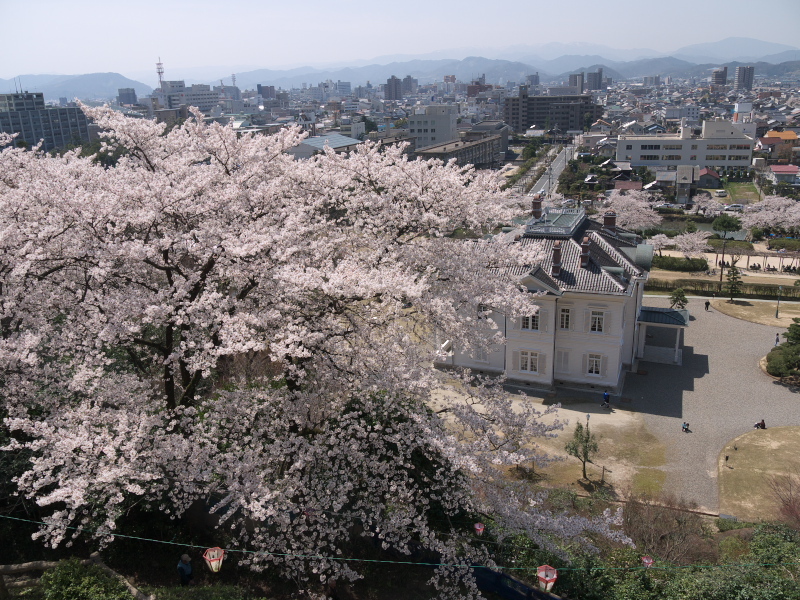 It is embellished in pink all around with 500 somei-yoshino cherry trees. When the lanterns are lit up at night, many people come to see the beautiful sakura reflections in the water of the castle moat. 【Public transport】Take the local bus at JR Hamamura Station and get off at “Shikano-cho Sogo Shishomae” bus stop (10-min walk). 【Car】20 min from Tottori Expressway’s “Tottori Nishi IC”. This mountain is well-known for its historical links to Emperor Go-Daigo. Take a scenic drive or enjoy a hiking course and make the most of Mt. 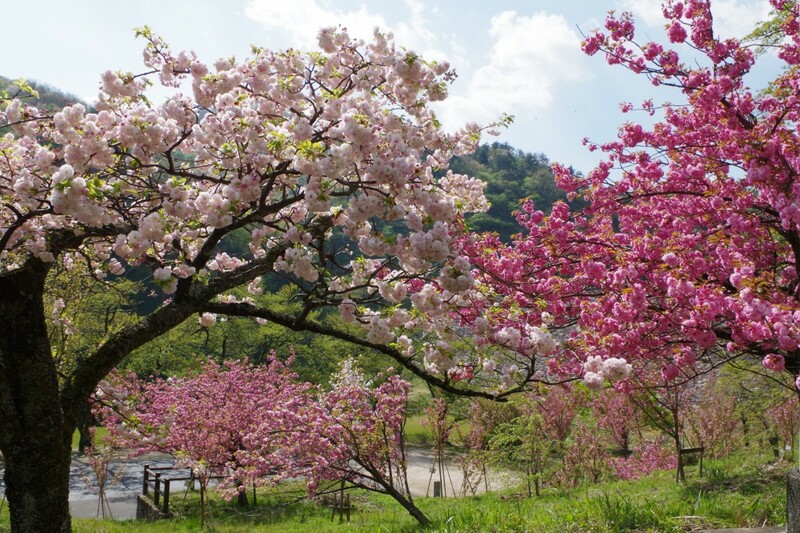 Senjosan’s abundant nature which offers a wide range of cherry varieties and numerous trees, including the late blooming yaezakura. 【Public transport】Take the local Kotoura Chonai (Senjosan) bus line (southbound) to Shonen Shizen-no Ie. 3-min walk from “Senjosan Shonen Shizen-no Ie”. 【Car】20 min from Sanin Expressway’s “Kotoura Senjosan IC” via Route 289. Located in Koyama Pond, this island becomes brightly colored with somei-yoshino and 30 other varieties of cherry trees. 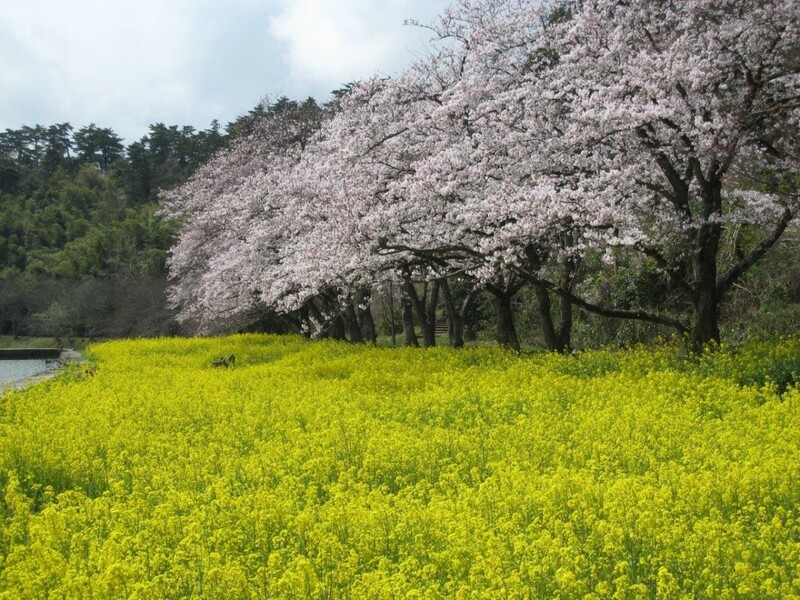 Rapeseed blossoms compliment the sakura blossoms in this season, adding contrasting colors to a must-see scenery! 【Public transport】20-min bus ride from JR Tottori Station. Take the Yoshioka Line and get off at “Aoshima Koen”. Bus stops right by the pond. 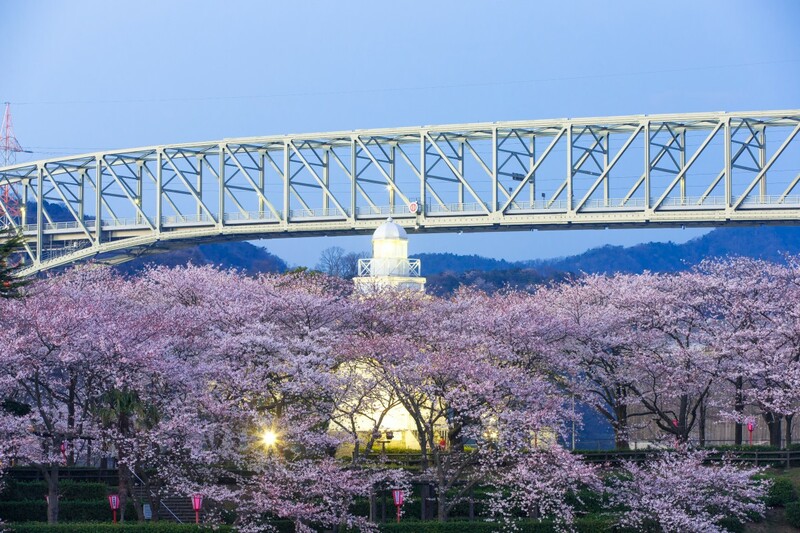 Enjoy viewing cherry blossoms along Sendai River. 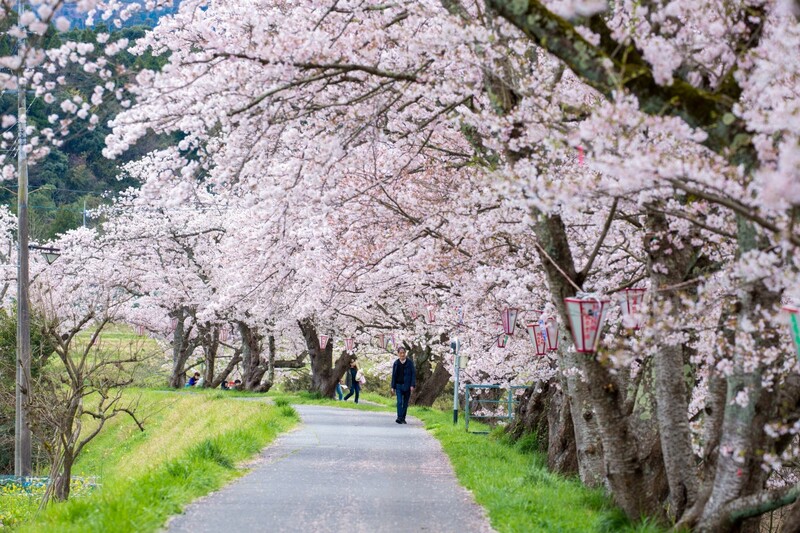 Take a 1.3-km long stroll to see all of the beautiful 180 somei-yoshino cherry trees, some with impressive branches that appear to hover over the surface of the water. 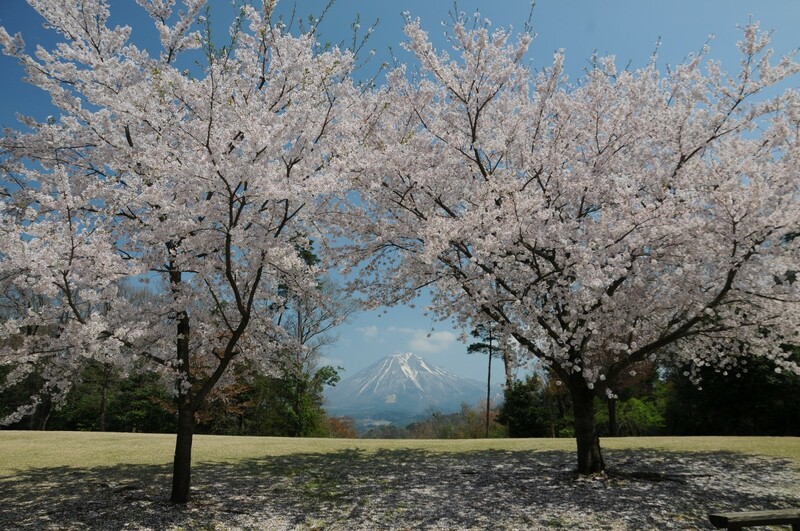 Late blossoming cherry blossoms at Mt. Mitoku Sanbutsu-ji Temple, known as Japan’s most dangerous national treasure. Characteristic of Mt.Mitoku’s area, blooming period start from mid-April. 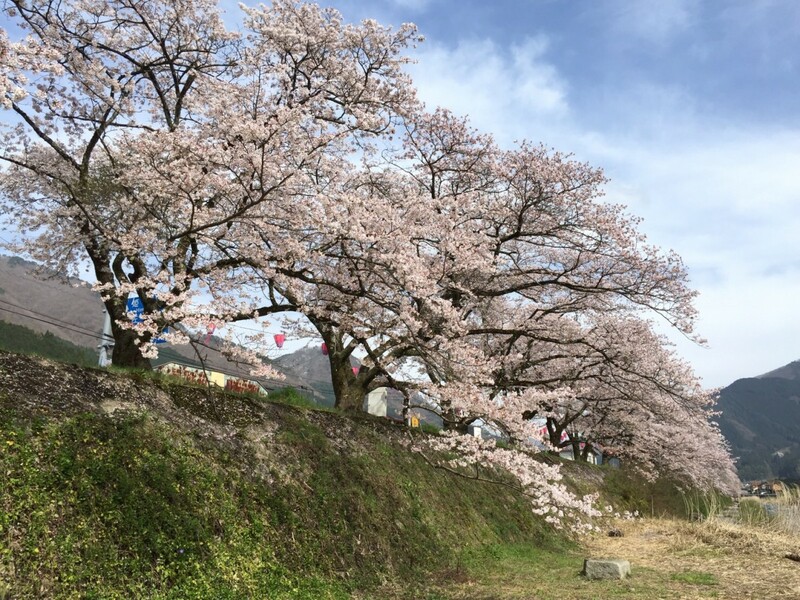 In the Sakamoto area at the foot of Mt.Mitoku-san, “Sakamoto Kannon Festival” is held every year in mid-April, and you can enjoy it together with beautiful cherry blossoms. 【Public transport】From JR Kurayoshi Station’s bus stop #3, take the bus Agei-Misasa line(40 min) . It’s a short walk from“Sakamoto” bus stop. 50 min by car from Yonago Expwy Yubara IC via Route 313 and Route 482 to Rt. 179. – A picnic sheet comes in handy for flower viewing as most places have no benches. – Disposable kairo heat packs and jackets are good to have as daytime temperatures can drop in April. They are a necessity for night time viewing! – Trash bags: be sure to take home your own trash. * You can find the above items at any 100 yen store. Be well prepared to enjoy flower viewing to the fullest. (2) Dango sweets or flowers? Enjoy the food galore sold at stalls! 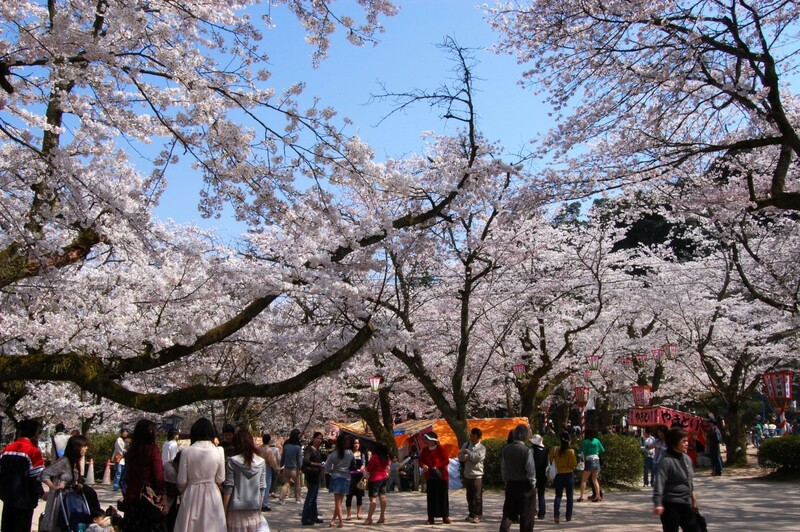 – The variety of food stalls of light snacks (takoyaki, taiyaki, and other) set up during the cherry blossom season makes flower viewing all the more festive and exciting! -Many roads near popular flower viewing spots tend to be heavily congested in urban areas. Please use public transportation. -Be careful not to bend or shake branches. – It is courteous to keep voices down and not play loud music as it may disturb other people enjoying flower viewing.